Once you have purchased an E-Book an email with a download link and code will be sent to you once payment has reflected in our account or a proof of payment thereof has been emailed to us. If you are not in South Africa and would like to make a purchase, you may use PayFast to process your payment. Alternatively if doing an international bank transfer, please be sure to cover ALL bank transfer fees. Describes the basics of a simple sandbag building system. It uses structural ladders made of timber latte, off-cuts or small dimensional battens that can be sourced from scrap material and which are nailed or screwed together. Includes info on renewable timbers, natural non-toxic treatments & preservatives methods, moon phase harvesting, boron treatment, solar kilns, suppliers etc. The info manual "EARTH BUILDING SOIL ANALYSIS AND ADOBE BRICK MAKING" has been extensively revised and extended. It now offers a detailed chapter on the Adobe Brick Making process including alot of descriptive images. Illustrates and explains in detail of how to make your own plaster using a mixture of lime, dung, sand and clay. This receipt, which is a traditional recipe from Mamre (Western Cape, South Africa) is particularly good and works like a charm. This document forms the theoretical basis of our practice. It details the six broad principles for green design, why they are necessary and what measures can be taken to implement them. 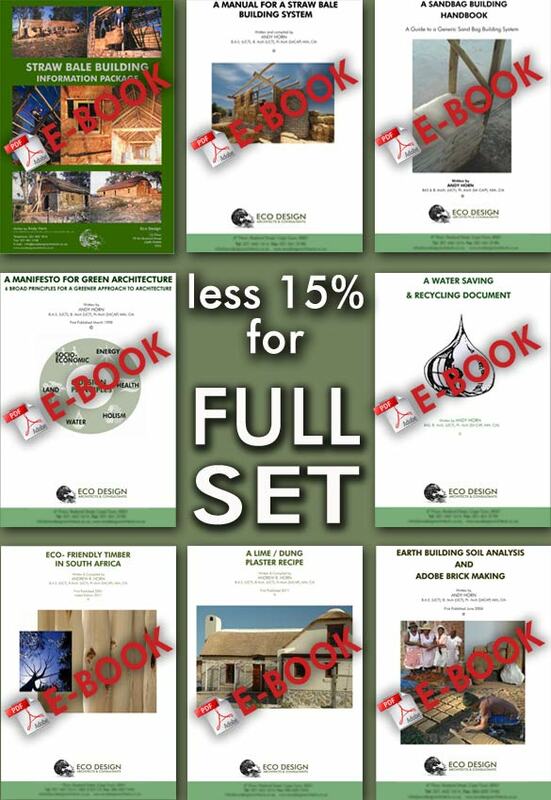 This is the complete set of E-Book Info Manuals from Eco Design Architects. Get a R255 price reduction if you buy all 7 of these Manuals.